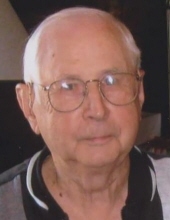 Roy Richard Hamersley, 92, of Midwest City died March 14, 2019 under hospice care surrounded by his loving wife, Doris and treasured family in his beloved town of Midwest City. Roy was born October 14, 1926 in Brownsville, Texas to Richard and Neoma Hamersley. Roy was the owner/operator of Lockheed Barber Shop for many years before going to work at General Motors automobile plant and has lived in Midwest City for almost 65 years. He and Doris have been long time members of Country Estates Baptist Church where he served as a Deacon and enjoyed his involvement with many church activities over the years. His interests included fishing, playing softball, baseball, watching college sports, studying the bible and yard work at his residence. Roy was preceded in death by his parents; 6 brothers and his sister. He is survived by: his wife of 72 years, Doris, of the home; son, Buddy Hamersley of Coweta; daughter, Marilyn Ford of Del City; son, Rick Hamersley and his wife, Melenda of Oklahoma City; his extended family; 19 grandchildren; 27 great-grandchildren and numerous nieces and nephews. Funeral Services will be held at 1:00 p.m., Tuesday, March 19, 2019 at Country Estates Baptist Church with interment to follow at Arlington Memory Gardens in Midwest City. Memorial Donations may be made in Roy’s honor to the church Building Fund or to Hospice Quality Care in Del City. To send flowers or a remembrance gift to the family of Roy R Hamersley, please visit our Tribute Store. "Email Address" would like to share the life celebration of Roy R Hamersley. Click on the "link" to go to share a favorite memory or leave a condolence message for the family.